The warmth of Gods word along with charming quotations bless your heart and refresh your soul in this delightful collection. Promise Journals uniquely combine the topically arranged promises of a Promise Book with the beautiful design and writing space of a journal. Every spread contains themed quotations and Scriptures to inspire your personal reflection, along with ample writing space to capture your own thoughts and prayers. Each journal has a different theme and is packed full of encouragement, hope, love, joy and relevant, inspiring messages to correspond with your own personal journey. 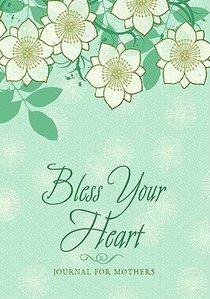 About "Promise Journal: Bless Your Heart a Mother's Journal"